Forward Air said net income in the three months ended Sept. 30 was $22.3 million, or 76 cents a share, compared with $18.3 million, or 61 cents a share, in the same period a year ago. Revenue increased 11.1% to $331.4 million in the third quarter of 2018 from $298.3 million in 2017. The company had expected earnings per share to be 77 cents to 81 cents a share, but that was driven down by $1.4 million in unexpected noncash charges related to vehicular claims, according to Michael Morris, senior vice president and chief financial officer. Morris said the company still expects to report earnings per share of between 81 cents and 85 cents a share in the fourth quarter. He also said the company’s board of directors has approved an increase in the quarterly dividend, to 18 cents a share from 15 cents. CEO Tom Schmitt said a tight truckload market in the third quarter drove up purchased transportation costs for all of its business units, which consist of expedited less-than-truckload, premium truckload, pool distribution and intermodal services. Intermodal had an especially strong quarter, generating operating income of $7.3 million on revenue of $50.5 million, compared with operating income of $3.8 million on revenue of $44.2 million in 2017. Expedited LTL generated operating income of $23.7 million on revenue of $188.5 million, compared with operating income of $23.2 million on revenue of $165.4 million in the same period a year ago. Premium truckload generated operating income of $1.7 million on revenue of $47.9 million, compared with operating income of $124,000 on revenue of $51.5 million in 2017. Pool distribution generated operating income of $735,000 on revenue of $47.3 million, compared with operating income of $681,000 on revenue of $40.2 million last year. For the first nine months of 2018, Forward Air said net income was $64.4 million, or $2.18 a share, on total revenue of $964.3 million, compared with net income of $52.6 million, or $1.74 a share, on revenue of $844.2 million in 2017. Schmitt said he expects the purchase of Southwest Freight Distributors to be completed within a month. “We anticipate Southwest will contribute $20 million of revenue and $3 million of earnings before interest, taxes and depreciation allowance on an annualized basis,” Schmitt said. Southwest operates a fleet of 113 company-owned and leased tractors, two straight trucks and 39 trailers, along with more than 700 trailers under trip lease arrangements, according to registration data on file with the U.S. Department of Transportation. 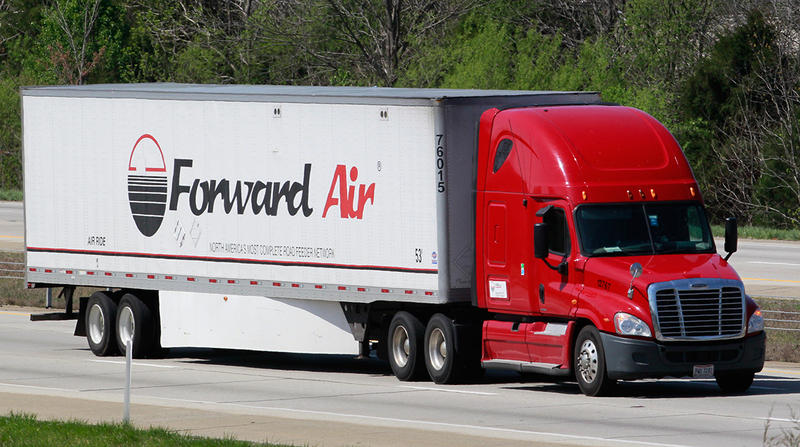 Forward Air, which is based in Greeneville, Tenn., ranks No. 33 on the Transport Topics Top 100 list of the largest for-hire carriers in North America.